Live on FOREVER, hopefully loved and Cherished! 1 Design $130 Free Ins. 2 des $160 Free Ins. 3-4 des $180 Free Ins. Two stick SET , 3 designs each $320 Free Ins. 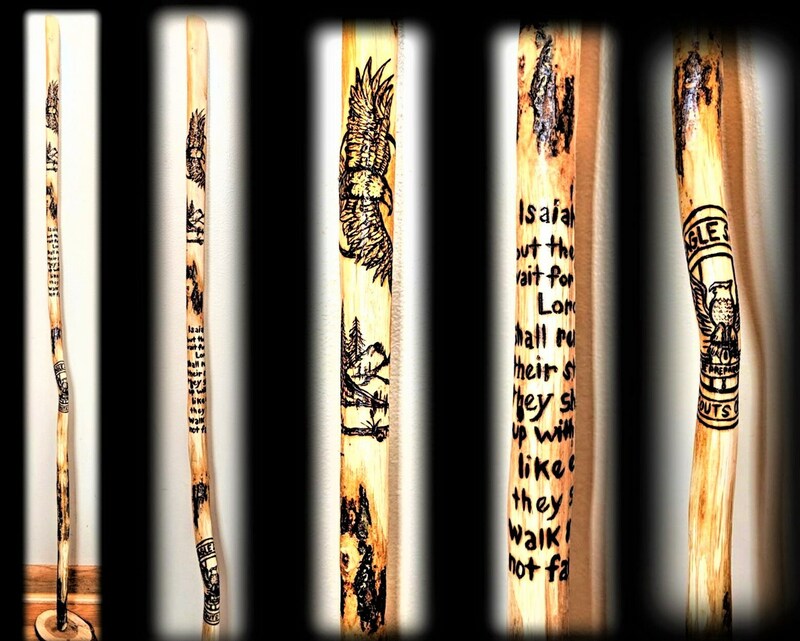 Walking stick / Cane 1-4 designs $160 Free Ins. Each Stick is 100% Hand created by ME... and made to order! I drill a hole and add a Genuine (up-cycled) Leather strap! I then Wood burn beautiful Art, Inspired by Nature! so there is no limit to what images you may have!!!! 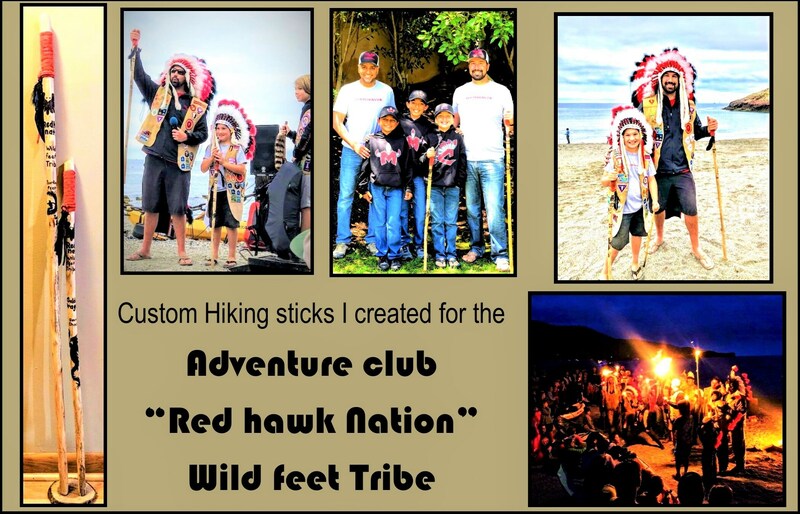 Unique "One of a Kind" Walking / Hiking Stick! I drill a hole and add a Genuine (upcycled) Leather strap! 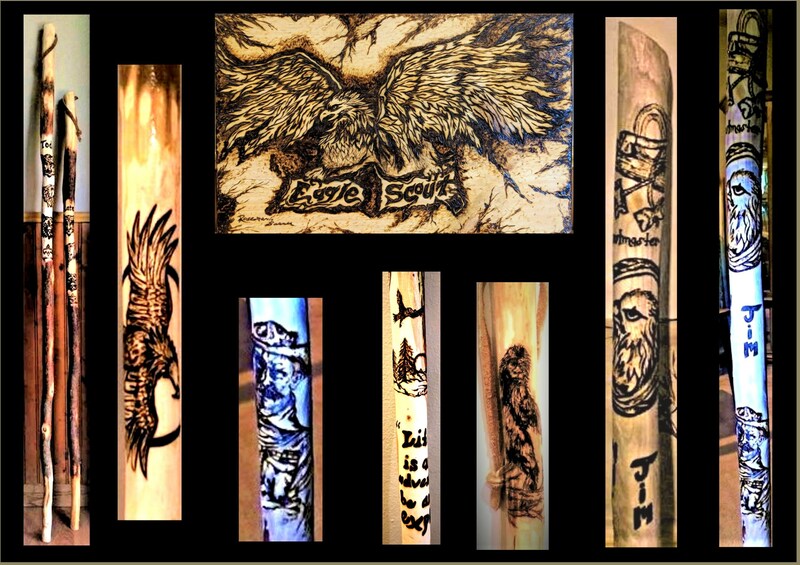 I them carve designs and Wood burn beautiful Art, Inspired by Nature! Ivy / Humming bird / Symbols / Frogs /etc. If you can think if ~ I can create it!!! ....... let me know your idea! message me with questions! 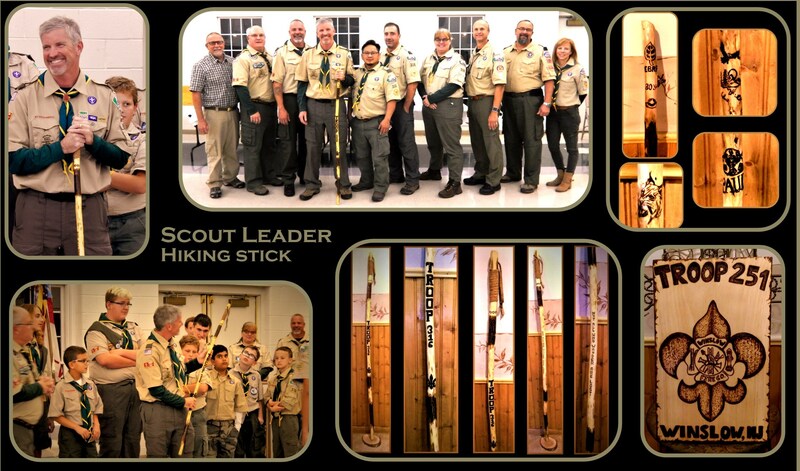 Boy Scout Trail Stick that he can add Badges Too!!! Small Beautiful Colorful Stick with Flowers, etc, for Grandma! Cabin Decoration, Hand or Display! is a device used by many people to facilitate balancing while walking. Walking are often can be sought by collectors. Some kinds of walking sticks may be used by people with disabilities as a crutch. and as a defense against wild animals. as famously used by Sherlock Holmes in his trek in "The Final Problem". A walking stick can be improvised from nearby felled wood. 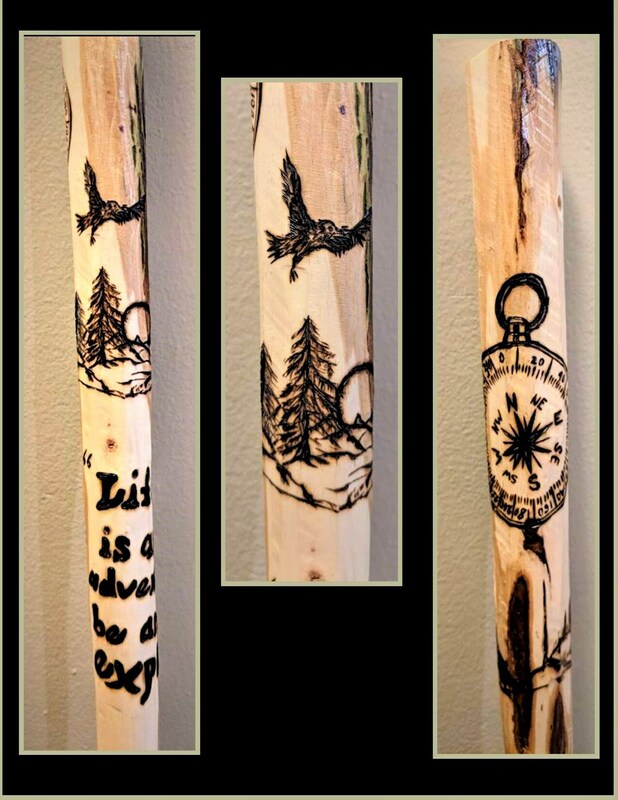 More ornate sticks are made for avid hikers, and are often adorned with small trinkets or medallions depicting "conquered" territory. 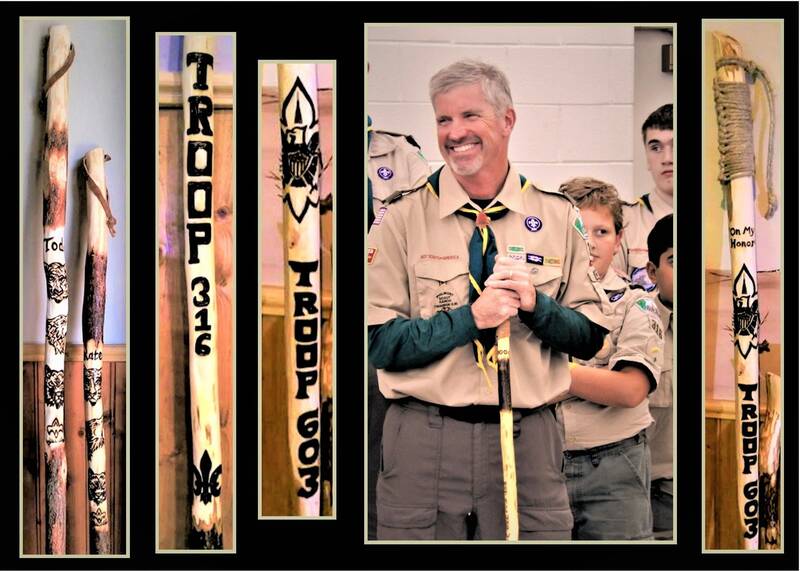 Wood walking sticks are used for outdoor sports, healthy upper body exercise and even club, department and family memorials. They can be individually handcrafted from a number of woods, and may be personalized in many ways for the owner. The walking stick has also historically been known to be used as a defensive item, for protection from aggressive animals and reptiles “especially when your pet is along”. Holiday shipping update! Any orders Placed after December 18 2015, will not be created and shipping until after 12/28/14, thank you and Happy Holidays!